Pours a great color that I want to call sunset brown. Those yellow/golden/orange hues of sunset mixed with with a light brown color. Topped off with loads of tiny bubbles that forms like Voltron into an ample head. That’s a hell of a smell. Very intense hop armoas getting up in your face with lots of pine, citrus, and some alcohol. The taste isn’t as “ruinous” as described, again according to the Stone book the blurb on the bottle was written at a time when it was one of the more bitter beers on the planet, now though it doesn’t seem nearly as extreme. Don’t get me wrong it’s very aggressive and up front with lots of bitterness and bite. But it’s also balanced out (very slightly) by some bread malts. Oh and all those bitter hops come with more citrus flavor. Not to be forgotten there is significant alcohol warmth which I find quite pleasant. Mouth feel packs a medium body and mild carbonation, not too much to write about here. 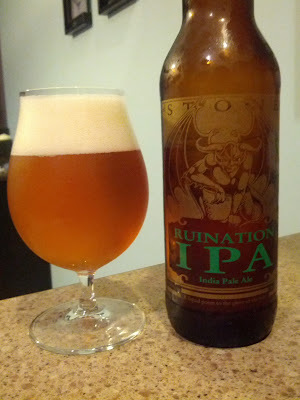 And now I begin to see the reason for the name Ruination, my palate feels trashed from this long and intense after taste. This is definitely something to end a night on because ANYTHING else will taste off. Per Stone’s book (review pending by the way) this beer was the first bottled (not first overall) Double IPA. I’m not sure how verifiable that is but it seems likely as it came out in 2002 and wither it’s first or second it’s still pretty cool to have an early beer from a now relatively common style. All that said I don’t really think this is an amazing beer and I’m in no rush to drink it again. I can see it as a nice reality check for what extreme beers can be or maybe as a nice shock to the system after drinking a string of lagers. FULL DISCLOSURE: This beer was sent to me for free by Stone. To our readers, and any breweries interested in sending me stuff, giving me free beer impacts the review in only 1 way. That way is that I WILL review the beer and I WILL write a blog post about it. Giving me free beer does not guarantee you a favorable review or that I will tell everyone to go buy it or anything like that.